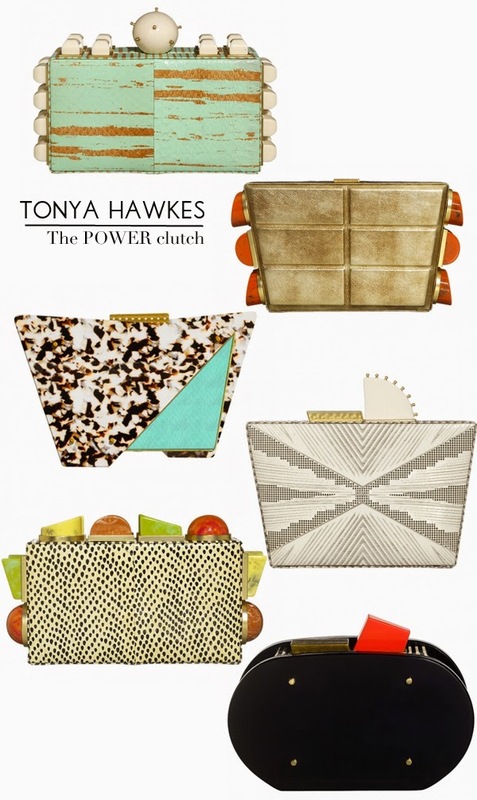 You need to know about these cool, edgy clutches by Tonya Hawkes. They seem like they belong to a powerful woman, right? Uhm YOU!! I'm completely fascinated by these and believe they would work well as heirlooms for your grandchildren (the excuses I give myself when contemplating buying something expensive). I have a brass clutch that used to be my grandmother's and let me tell you the stories that clutch could tell if it could talk! If you add all those fabulous parties my grandmother used to attend and add mine to the mix, we would have a pretty large number of good times shared and celebrated. It's kind of cool that I was able to derive such pleasure from something as a simple as a clutch. It connected us somehow, throughout time. A beautiful and chic clutch is a powerful thing. Don't you need one for your granddaughter? See more of her designs here. They're super fabulous! I love the first one! Albertina I can't believe I came over to see such an artful feature. These clutches are stunning!! Tonya is an extremely talented artisan,. Hmm which one ( or more) do I want? They are stunning! I want the first one!! Ummm.. Have I ever seen a more fabulous clutch? The answer is no.